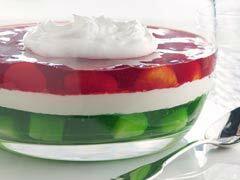 This colorful layered Jello salad recipe is perfect for holiday entertaining or any time. 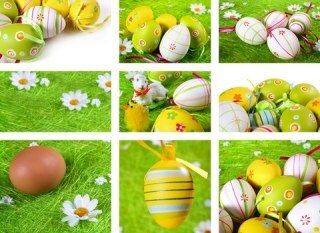 It is easy to make and looks pretty sitting on the dining or buffet table in a clear glass bowl. Mix the red jello powder with 1 cup hot water and 1 cup cold water. Pour into a mold and let set. In a separate bowl, mix half the lemon jelly powder with 3/4 cup boiling water. While hot, mix in the cream cheese. Let this thicken and then mix in the whipped cream or dessert topping mix. Pour this over the red jelly and let set. In a separate bowl, mix the lime jelly powder with 1 1/2 cups boiling water. Let thicken somewhat, then add the pineapple. Pour this over white mixture and allow it all to set fully. This recipe is very pretty so if you have a nice clear glass serving bowl, it will look great. Mix it up with the jello flavors and colors of your choice. Add a variety of fruit. Mandarin oranges (drained) look great in orange jello or try well drained fruit cocktail in any flavor. Drained pineapple chunks are great in the lime layer. I have suggested red, green and yellow jellos for a festive look, but try it with red and blue for a patriotic look, or just use fun colors of your choice. Layered salad recipes are so easy to make but look sensational, so people think you made a real effort. The best part is everyone loves them, so they get eaten up each and every time. This jello salad is just one of the wonderful free salad recipes at CookingNook.com. Find the rest here.